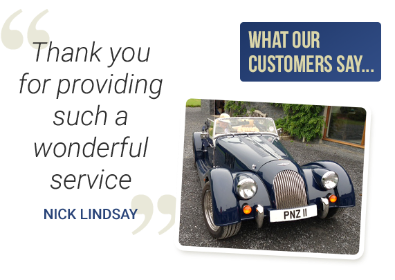 Speedy Registrations have been trading for over 30 years and in that time we have had thousands of testimonials of happy customers getting in touch and thanking us for our wonderful and "speedy" service. If we included all our well wishers, we'd need a dedicated site for it but here are just a few of the people who we have helped over the years. 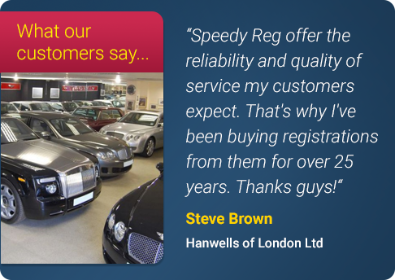 Speedy Registrations have a TrustPilot score of 9.9 out of 10 across all 1629 reviews. An amazing 1561 are 5 star reviews which mean that 95.83% of the reviewers know we are a 5 star company. We get in touch with every customer after the order has completed, giving them the option to leave a review, so if we get it wrong, everyone has the option to tell us, and whenever a customer feels we have provided a less than exemplary service, we aim to find out what happened, see if we can put it right, but most importantly learn from it, which is why we have such a high rating. Clicking on a review will take you through to TrustPilot which allows you to see they are all verified customer orders. Excellent professional service....can’t speak highly of the service I received and would have no hesitation in recommending. Thank you Speedyreg. Good comms and a 'speedy' service. Only 1 word to describe this company BRILLIANT !!!! Rec'd a phone call about 0930hrs by the end of the call it was done and transferred !! I thought it was a joke.? No,had a follow up email,next day plates arrived and receipt, genuinely the best service I've experienced in my life and I'm 62yrs old with no connection to this company. Do NOT hesitate to use this company. Thankyou very much indeed. Alan. Really easy process. Nice helpful friendly staff. Definitely recommend Speedyreg! Everything was so smooth, After purchase Jayne processed and kept me informed every step, very professional, well done guys! OK. I have seen these sort of reviews but never really believed it could be so straightforward...hey ! It really is with these guys !! Now i don't work for them or have any connection, just a very pleased customer, here's the deal. So i rang them on tuesday..had a few number ideas in my head and the price i wanted to pay...picked the number, paid the money, plates arrived in 2 days they called me on sat to confirm all done...email from DVLA ( authorisation certificate ) SO simple..best customer service i have ever had . So there you go. Efficient and quick, most paperwork and plates arrived next day or day after, staff know their stuff. My second time using, 100% recommend. You could not have picked a better name for your company. Absolutely gob smacking amazingly fast service. Ordered the number plate Friday lunch time firstly online then over the phone to confirm the details. Everything in place and ready to put the new number plate onto my car by Tuesday morning first thing. A Top Notch Company who I will have no hesitation in recommending to anyone in the future. A Very Big Thumbs Up From Me. Very helpful on the telephone. Everything dealt with speedily! I would have no hesitation in recommending this firm. Speedy by name, speedy by nature. Unbelievably quick turn round, and Speedy deal with all the boring stuff with DVLA. Also, regular phone calls from them keeps the customer well informed how things are going. Very highly recommended. A fantastic service, great prices, helpful staff and ever so prompt. Would highly recommend them to all. Very quick and friendly service. Every detail covered, would certainly use Speedy Registrations again. How refreshing these days to deal with a company who actually do what they say they will when they say they’re going to! Faultless service carried out politely & speedily. Wouldn’t hesitate to use this company again or to recommend them. Very helpful, easy and fast transaction. Speedy reg we're very speedy. Speedy reg we're very easy to deal with and the transaction was completed very speedily. Excellent! Great service. Fast and efficient. Great value. Definitely recommended. Excellent customer service! Staff at Speedy Registrations very helpful and super efficient! I would highly recommend the company! quick professional service what more can you ask for . Second time dealing with speedyreg, used previously for another cherished plate. Just as good as they were the first time.Excellent service. Definitely recommended! Fastest transfer ever, completed in a matter of hours. Very painless process and the number plate I wanted. Great service, VERY speedy response again for my second plate. Many thanks. Cheapest anywhere for the Reg Number I wanted and as their name suggests, very quick service.Paid the deposit online and was called shortly after. Number was transferred and assigned in less than 45 mins. One phone call and they do everything, very quick and efficient,very well organised. Speedy registrations are without doubt speedy, all completed without any fuss and customer service is second to none, would definitely use again if I was to purchase another number plate. Thanks speedy! Amazingly good people to deal with. Amazingly quick and thorough,last time I did this with another company it was 10(!) forms to fill in and took ages,so this company are a breath of fresh air indeed. Start to finish in 6 days! AND no forms to mess about with either!! VERY HIGHLY RECOMMENDED! Excellent value for money plates. 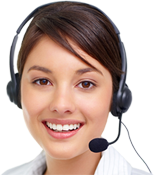 Very easy process to use online and customer service input was very good, with them actually ringing back after they said they would. I would definitely recommend using Speedy Registrations again. Well done to all of the team. Fast and very helpful, plus the best price by a mile. Excellent communication and efficient service. This is my third time using Speedy Reg and have always found them excellent, their communication is great and the service is very efficient. Look forward to getting my new number. Thanks again! Great service. From first enquiry to competed transfer took only 36 hours and a great price to. I would highly recommend their service. Very quick, efficient service. 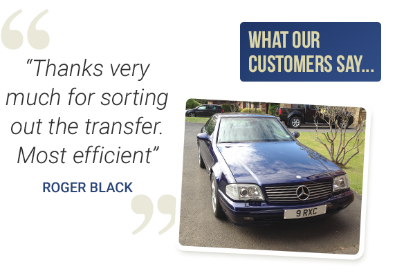 Information provided from the start of the purchase process to finalizing the deal leaves no doubts concerning the process and dealing with DVLA for actual transfer of plates makes it a pleasure to do business with them. I found Speedy Registrations to be very easy to deal with. We agreed a price and within 48 hours all the paperwork was completed and the new number was on my wife's car, it can't be much easier than that!I will use them again and hope that they are as efficient at selling my number as they were at selling me someone else's! From an initial enquiry - on a Sunday afternoon - the response was almost immediate. My questions were answered and by early that evening the deposit paid to secure the registration. Both verbal communication and written confirmations/provision of documents were impressive. The delay in the delivery of my car was no problem to them and the final transfer took less than a minute online whilst I was on the telephone to them - again very impressive. I cannot see how they can be bettered. Really quick transaction and was kept up to date throughout. Amazing service. Could not ask for a better service. Speedy by name speedy by service too! Very helpful and courteous customer service. Would recommend happily. Completed on the phone ! Brilliant .All done whilst on the phone ! Plates on the vehicle within the hour !! Great Service ! 3rd time i have used these guys and their service is excellent. Totally recommend them! First class service from start to finish. Purchased my new plate on Saturday and by Wednesday it was on my car. Absolutely brilliant!! Outstanding, quick, friendly, service! 10/10! Outstanding service from them, even though I bought about the cheapest number plate possible. All done online and transfer on phone. Highly recommend these friendly people and company! Great friendly and helpful service. No less than professional throughout the whole procedure. super effecient and very polite. Quite an amazing experience. Pressed the button to purchase. Seconds later an email. Within minutes a phone call. Within 2 days everything including the DVLA transfer was complete. An absolutely first class experience. I have no hesitation in recommending this company. Great web site with a massive choice, clear and concise with all the info that you need . In terms of doing business everything was straightforward, they did what they said they'd do and things happened as they were meant to , I ended up buying a second number too !!! Fantastic Service!!! Swift, organised and super efficient service. First class service and very pleasant to deal with. No hesitation in recommending. I will give 6 stars if I could. From a returning customer. Brilliant service with very fast turnaround. They couldn't have done any better. Highly recommended. Very helpful and professional service. I phoned them and they did the rest. I'd recommend them. Speedy registrations says it all. A super fast service, comes highly recommended. First class. Good speedy service ! thank you Sharon. Helpful team and fast service. 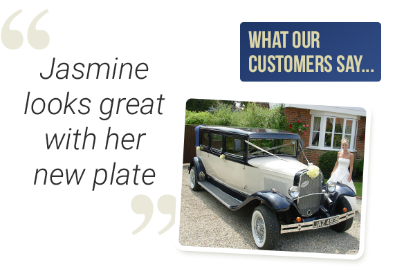 Excellent Choice Excellent Value Excellent Service Best I’ve had from Plate Sellers From the first point of contact right through to supplying the Plates and Registering on to my Vehicle. Highly Recommend. The whole process was dealt with very quickly and efficiently and in no time at all the new plates were delivered to my door. I was kept informed of where things were up to by telephone and everything went very smoothly. I can't praise them enough. Got an email within a day of purchase and the transfer was done immediately. Very polite helpful staff, and excellent service. Speedy by name, speedy by nature. From purchase to fitting the plates was four days. D.V.L.A were all handled by Speedy Registrations so a complete, no hassle service. Easy to deal with. They did everything for me - all I had to do was fix the plates to the car. registration came through quick and was effortless, we were actually recommended by a previous customer and we would recommend ourselves. Very helpful, SPEEDY, and reasonably priced. Would definitely recommend. Excellent service again, 2nd time dealing with speedy registrations, so easy and fast , posted letter back on Saturday, plates on Monday afternoon. Brilliant!! Excellent, fast professional service. Explained the process fully and kept me informed of progress throughout. A very fast and simple service. New number plates arrived in 2 days. I have bought a few plates now from speedy registrations and they are brilliant! I would recommend them to anyone. They sort out everything for you even send the actual plates already made up ! Great service and excellent follow-up on my order. No problem from making the call, to buying the plates, New plates on the car in 4days. Recommend speedy registrations. Excellent service. Transfer was done over the phone, couldn't have asked for better service. Professional and speedy service received. Very easy to deal with and they did everything the said they would.....Can't get better than that. They made it simple and easy to do excellent service. Brilliant service, what more can I say ,highly recommend. Great company as always to deal with. I give them the registration I want and they do the rest for me really helpful too! Fabulous service from Speedyreg! Would definitely recommend them. Have already been telling my friends. Very happy with the service I received. Easy to buy and transfer number on to car I only had to contact my insurance company and get plates made everything else was done for me . Fantastic service from these guys. Quick, reliable and hassle free. Hope to deal with again. Give them a try, you won't be disappointed!! This is the 2nd time I have bought a plate from them. The smoothest process. After the online purchase / deposit, they called and did all the transfer over the phone, so no form filling or waiting around. My new plate was on the car within 24hrs! I have no reservation in giving Speedy Registrations Co Ltd a five star rating. I purchased a Cherished Plate yesterday. The support, helpful advice and constant timely communication was totally superb. I found the Customer Service one of the best experiences I have had the pleasure of experiencing in a long time. In particular Alanda in Sales made my transaction speedy and efficient. A very big thank you from me. I am very pleased with my Cherished Plate which is now on my vehicle. I would recommend Speedy Registrations Co Ltd to all! This is my third purchase and I have always received first class service. I would highly recommend Speedy Registrations. Excellent service , thank you very much !!!! Very efficient and very speedy!! Excellent service, Fast transfer and great price. Good, helpful service. Paperwork arrived really quickly. Another smooth registration transaction with speedy registration. Transaction is always quick and so easy from start to finish. Very efficient and professional. Order was processed quickly. Really nice polite staff on the telephone. Excellent all round - 5 stars! They made the process very easy only took a matter of days and I had my new reg have recommend them to my family and friends. Very efficient, professional and friendly service. One phone call sorted everything. Clear explanation of the process which SpeedyReg handled for me. Simple really. Very pleased and would highly recommend. Great prices. Efficient and fast service. Friendly and courteous staff. And when they say they will ring you back, the actually do so! Very refreshing to deal with. My transfer was completed over the phone on a Saturday morning. All the documentation arrived in a few days. Even the good old DVLA seem to be sending out new V5's in a couple of days! A great customer experience. Super quick service at a reasonable price, thanks Terry. Excellent all round service . Thank you. First class, they looked after me and they always keep me informed step by step, and they did all the work I did not have to do anything they did it all. It was so easy to do, called to see how long it would take as I had not received the documents from DVLA. They went on line and confirmed it could be done, 10 minutes later a phone call to say all done, email with authorisation form. Two hours later I checked to see if the new registration showed it taxed and sure enough there it was. Bought number plates the next day. Oh and best price too. Awesome service from start to finish A**Got the plates I wanted with no hassle. easy transaction throughout - I always use this company when possible. thanks. I was totally satisfied with the service offered by Speedy Registrations, if there were any complaints you would have most certainly heard about them. Brilliant service and such lovely and helpful staff. 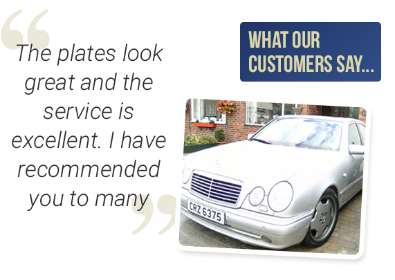 Very good value, quick delivery of great plates. Thank you so much. Absolutely excellent service from start to finish. Pleasant helpful staff, good quality plates, super-speedy delivery. We wouldn’t hesitate to recommend. This my first time buying a private plate and the whole process was seamless, I had no worries at all, the staff that I spoke too where very knowledgeable, courteous and helpful. I will be using this company again and will be be recommending them to friends and family. I cannot wait for my kids to pass there driving test so that I can purchase their plates too. Thank you all at Speedy Registrations. Quick and easy to buy a registration. Very helpful on the phone. I would recommend this company without hesitation. My friends all think I paid a lot of money for my registration lol. Bargain. Very quick and good service again,many thanks. Fantastic service. Transferred to car within 24 hours. Would definitely recommend. Absolutely excellent customer service, they helped and guided me throughout the process. Could not fault them in any way, they kept me informed and updated at every level. Very efficient and knowledgeable staff who took all the hard work out of buying and registering my car and plate. Well done guys I really appreciated it. Fast and honest transaction. This was my first ever reg purchase and they helped me through everything. Above and beyond. Thank you. Excellent service and prompt delivery. Would highly recommend. Thank you. Amazing company to deal with. Easy and speedy transaction. Fast, efficient, honest and very competent. Will always use them. Excellent service - this was my 3rd purchase from this company didn’t even look anywhere else! Excellent service, very fast, very polite and good communication, perfect to deal with. No hassle transfer kept me informed every step of the way. Not always consistant in following up and replying to enquiries but overall they know their business. Fast friendly service, answered all the questions before I asked them. Paperwork, number plates and DVLA all sorted in one call, everything received within days of transaction. Excellent company, would recommend to anyone who likes everything hassle free! Superb service. My third time using this company and am pleased to highly recommend. Excellent quick hassle free service! Quick, friendly and helpful. great service! Excellent service and products. Could not fault. Speedy Registrations lived up to their name...fast, efficient...speedy. Their customer service was excellent and supported us throughout the process. Thank you! Great service thoroughly worth my new number plates all very professional. Excellent service. Very helpful. Would not hesitate to recommend. Speedy, easy transaction plus they did all the paperwork with the DVLA. 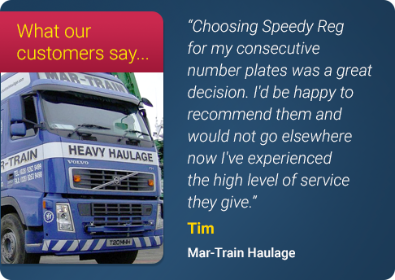 HAVING BOUGHT MANY PLATES FROM SPEEDYREG OVER THE YEARS, THE SERVICE IS EXCELLENT, QUICK AND THEY HANDLE IT ALL FOR YOU... STAFF ARE VERY FRIENDLY & HELPFUL.... HIGHLY RECOMMENDED …. Excellent & speedy service. Would have no hesitation recommending to friends. Extremely professional! Service was completed within 48 hours. It really was speedy! Fantastic service and yes, it was speedy! After sending V5C to them, 3 working days later I was able to put my new plates on the car! Great service, this is the second time I have used these guys and there service just improved. Highly recommended. Quick and easy. Good, responsive customer support. Excellent. Having never had any experience of buying a number plate the staff were absolutely amazing. From the online purchase to the next day delivery of documents to the personal assistance in assigning the plate I would recommend this company. Superb. First class service, professional in every respect, would highly recommend to anyone and have !!! Excellent Service everything was done more or less the same day. All I had to do was make a phone call to confirm details. Fabulous service,very helpful ,everything is done for you,its so simple ,we have used them 3 times now and would go back to them everytime. I would 100% recommend Speedyreg for their fantastic hassle free service! Always very polite and efficient and would recommend everyone to use this company.